I had a bright idea to knit baby Laney a dress, the only problem is that the pattern comes in one size 0-3months & she just turned 3 months old this week! Luckily, she is small for her size (currently in 0000) & I actually chose a size larger knitting needles so hopefully all will be ok.
Back in June I won a baby quilt, I was totally blown away with it & felt guilty that my emailed thankyou just wasn't enough. After my baby was born, one night as I watched her sleep tucked up in that quilt I just new I had to make the quilter a proper present to express my gratitude. I started a project, a crocheted cardigan for my baby girl - I was a good girl, read the pattern, found the yarn, hooks and started the pattern. Until, I discovered, I read the pattern wrong. Well not the pattern, I guess you'd say I read the ingredients wrong! These crochet balls/baubles are a quick easy project & once you have made the first one, you will be able to whip them up easily within 30 minutes. The hardest part is holding the stuffing down whilst you work the last row! I really want to show you some woolly love right now. Even though it's nearly summer down here (at the near bottom of the world), I've been whipping up some hats for baby Laney, or should I say Baby Sister or Oni, that's what bubba Joe calls Laney (he can't say L so Laney sounds like Oni when he says her name!). I love to start new projects. Wait, let me start that again, I LOVE to start new projects before finishing other things! You see, I always want to be prepared, I just HAVE to be prepared - I mean, what if I want to crochet at midnight but don't want to concentrate on a pattern or what if I want to knit in the car or what if I want a challenge myself - I need to be prepared for all of these scenarios. After a bought of moody blues bought on by the tiredness & the exhaustion of having a newborn baby and the hormonal fluctuations as you realise that you don't carry that baby safe & sound inside you anymore.... I went shopping online & bought myself some crafty books to cheer myself up! I chose this book, Knit-and-Crochet Garden: Bring a Little Outside In because of the cover (yep, I buy books by their covers! ), can't resist men knitting, crochet blankets & gardens! You know I had a baby right? An itty bitty baby right? On the 10th September at 7.19am, my husband & I welcomed our second child into the world, our daughter Delaney Isla was born weighing a slight 5pounds 3ounces (2.4kg). With our exciting trip (yeah!) planned & underway, I thought I'd better start something on the hook that was quick, easy & no pattern reading or excess yarn needed. So I started another project bag.... but I need to undo it & start again as it is supposed to be FLAT not looking like a bra! But hey, easily fixed and it will give me something to do whilst bubba Joe is napping on holi! I belong to a knitting group, do you? I kind of feel like I'm 'coming out of the closet' by saying that because many people laugh when they find out I belong to a knitting group but hey, I'm not ashamed of my hobby & I'm not embarrassed to knit in public either so I ignore those titters & sniggers that I hear & happily attend my group at the local cafe. I don't want to show you the pattern yet, I want to tease you for a little bit because I am quite excited by this pattern & can't wait to see it come together! I've been making more booties, this time with a new pattern from The Lovely Crow - see Ravelry for more info here. Right now, I've got two current yarnie projects on the go. The rainbow stripey thingy was going to be a snuggle sleeve for the baby but the yarn is too fluffy for that, so bubba Joe is getting a scarf (which he is very happy about!). Hey there! Would you like to win this groovy crochet flower garland that I made just for you (if you win it that is!)? I finished it, what do you think? Ever decided to do something out of your comfort zone? I know, I know you are about to say LAME!!! ... but I'm knitting a baby thingy in colours that are so not me, rainbow, erkkk. Anyways, I like to step outside me occasionally & do something a little different (it's cheaper than a holiday)! It's growing & I ADORE it! Do you?? I so do and I can't wait each night to add another row or two! After a few brain strains with the doily pattern that I am currently working on, I decided one night to have a break from it and sit down, relax & just crochet without thinking. Do you like to test yourself? Do you like to step outside your comfort zone and try something challenging? Remember me telling you last week that I was doing a quickie crochet project? Well it was a quickie & now it's done & even posted. On my hook is a quick project and by quick I mean it will probably take me two days & that is only a few hours each day. Well, that is the plan anyway but remember that I am pregnant (in my 3rd trimester now) and I'm potty training a 2.5yo boy! Good luck to me!!! I finally (finally!!!) finished the tunic dress that I was knitting for bubba Joe's girliefriend Zoey. I had to undo it heaps, reknit, undo, reknit - ugh! This dress was an extreme test of my patience but I think it was worth it in the end, what do you think? Look at what I received in the post the other day (oops I mean the other week!) - a hand-sewn quilt. How cute is it! Taa daa for my hottie! Yay for me, that's what I'm feeling today! Yep, I am feeling very proud of myself! I finished my hottie for the #hottiechallenge2013. I hooked up a few quick flowers on the weekend to finish off a project. Do you like them, aren't they cute! I am feeling the need to make more but have no real reason too ... but then I thought of you, my followers, perhaps I could make a pile more & join them into a garland as a giveaway - what do you think, would you like to win a pretty floral crochet garland for your wall or window? This is the post where I want to give up knitting, in fact, I am so frustrated and annoyed with myself that I want to give up all craft.. but I won't, I hate giving up, I'd rather suffer through multiple failures until I find something that I can achieve that I am proud of. Do you ever feel like that? I'm really loving the progress of this new crochet pattern for The Hottie Challenge. What do you think, do the colours work? And ugh, can you see all those ends that I'll have to sew in!! And with that out of the way, have you signed up for The Hottie Challenge via Curlypops? I did, this is my first year - the deadline is mid June & there is still time to sign up now - so why don't you? The money raised goes to a worthwhile cause. So go on. Do a hottie with me! Above is a sneek peak of what I am making for my hottie cover - I chose bold autumn colours & a new crochet pattern .... I hope it turns out like I have pictured it in my head! Oh em Geeeee, the birthday is this weekend - this dress/tunic needs to be finished for it as it is the birthday gift. Quick, knit knit knit knit. Stop procrastinating, put down the e-reader Rie & knit! I've been clickety clacking my knitting needles this week. I working hard on the dress for bubba Joe's "girlfriend" (in his mind she is!). Giving gifts that are handmade - gifts that will be useful or eaten are certainly the way to go. If you agree, then read on as I have an awesome, tasty gift for you to make & then give! 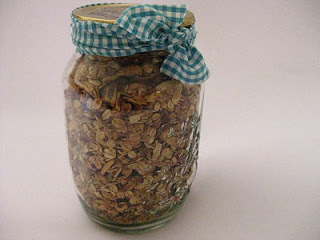 Here is a quick, last minute gift of Granola to make for someone special. Nah, there is something wrong with this pattern, it's just not right. I've done something wrong. After several days of debating this with myself (& sometimes with a two year old boy), I've decided that I read the pattern wrong but HEY, it's not my fault, the pattern doesn't read smoothly! You see, one of the problems with getting patterns off Ravelry is that that normally aren't written by professionals and have unclear instructions in them. Where I went wrong in this pattern is that I turned the project & knitted back down as that is what made sense in the way the pattern was written, in fact, if they had taken their time to write DO NOT TURN - that would have saved me heaps of stress & time! Do you find this too, that sometimes the patterns from Ravelry are always that clear or is that my muddled head? I picked up the sticks again today & started a new project. What pattern am I using? --- it's one I made up! ....I'll let you know how & if it works!